Dancing through life with my noisy shoes. Can’t wait! Midlife crisis or just another six weeks of something I MUST try? Not sure yet. But my latest obsession is tap dancing. 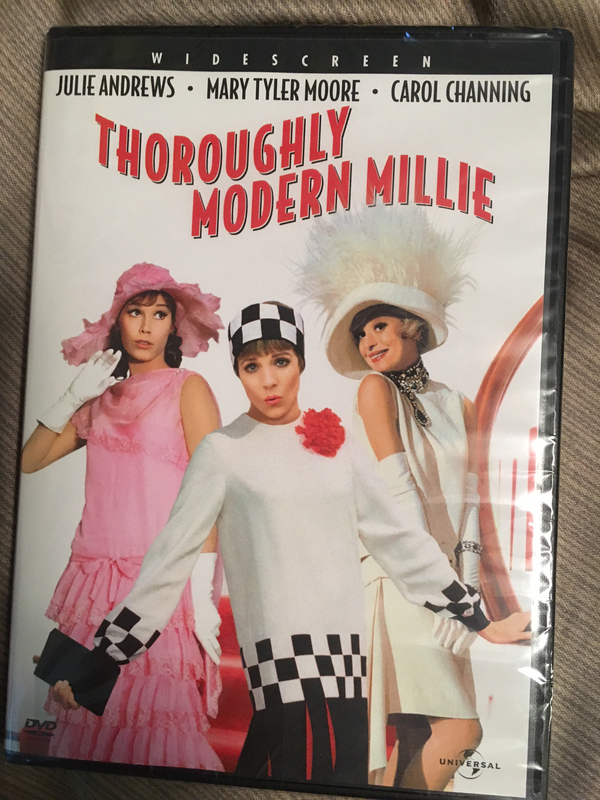 This summer I was overcome with inspiration thanks to Thoroughly Modern Millie and La La Land. My husband is getting just a bit tired of hearing Another Day of Sun and The Tapioca blaring around the house. It’s time to move my obsession to the basement. I’ve ordered “how to” videos. I’ve created a logo for the front of my concrete basement tap room. I’ve assembled a group of friends who are willing to tap with me. I’ve purchased tap shoes. And now all I need to do is clean my basement. This was too good of a pun to pass up. I’m not sure it matters, but it has me asking the question. Why? Why tap dancing? As a kid I was forced to take ballet when my gymnastics coach told me I needed some grace or I would be done in the sport. I was done. Gymnastics had already given me all I needed to make me smile. Run. Swing. Flip. Fly. Grace not necessary. Tap dancing is different, I think. I hope. It looks wild and tiring and musical and a little like exercise. These are things that all make me smile. 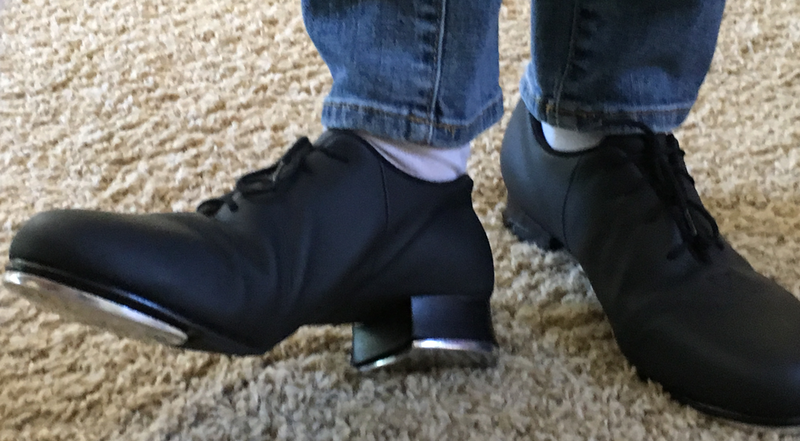 When I put my tap shoes on for the first time yesterday, I was not disappointed. I already sounded like an instrument when I walked through the kitchen. It was so cool. I wore them for a few hours just so I could hear myself walk. Noisy shoes! I love them. I want to wear them all day everyday. I want to tap dance in the elevator like Julie Andrews and Mary Tyler Moore on my way to my office. I want to tap dance through the supermarket parking lot. I want to tap tap tap my way through life. I guess I want my noisy shoes to shout to the world that there is joy on my way…even when the way I am going is really, really hard. I can let my noisy shoes remind me of the “happy” as I walk through the sad. It’s just so hard not to smile when your feet make such amazing noises. This is a crazy tap dancing classic! Stopping to smell the flowers on my adventure in Maui. 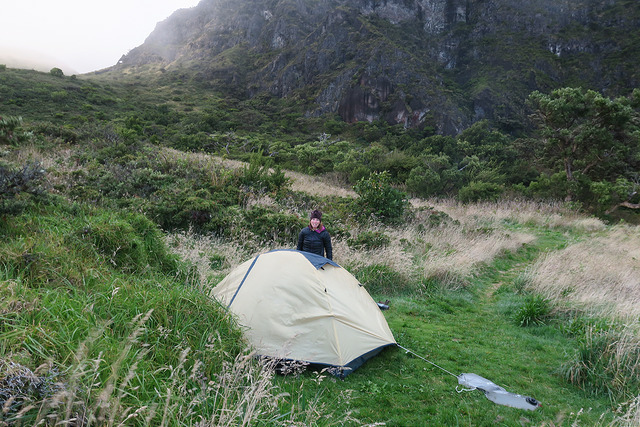 Few people go to Maui to spend it freezing in a tent in the rain. 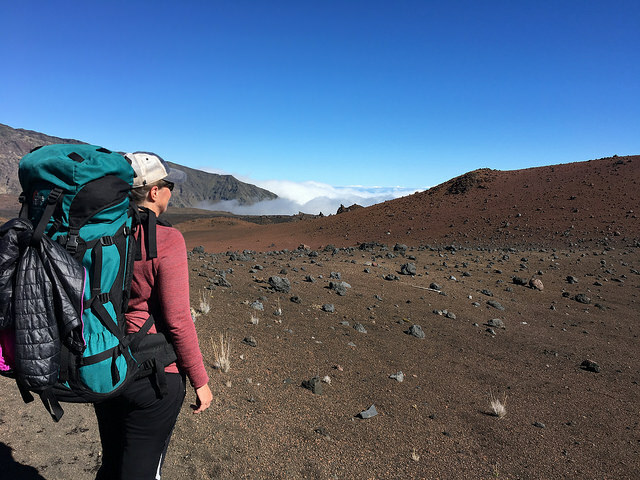 I know this because in three days of hiking through Haleakala National Park, I did not see another soul on the backcountry trails. And I wouldn’t have traded my experience for three extra days on the beach. No way. With a time change of four hours, we were up bright and early and left the hotel in the dark to avoid the alleged difficult road and traffic on the Hana Highway. 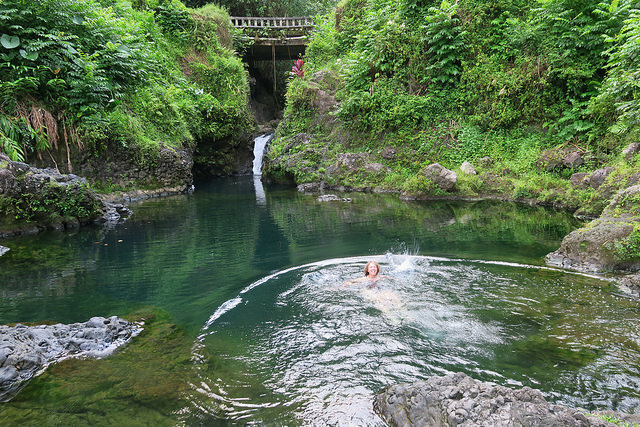 Our goal–circle the east side of Maui, seeking out awesome pools and waterfalls. Our route around the island on the first day started at 4:30 AM. We had the highway to ourselves and were able to hike to our first hidden pool by the light of our headlamps. We drove off the highway for a detour to see the sunrise at Hanomanu Bay. At about mile marker 17 we got out to hike down to the often missed Ching’s Pond. I got my wake up call with a cold dip at 7 AM. 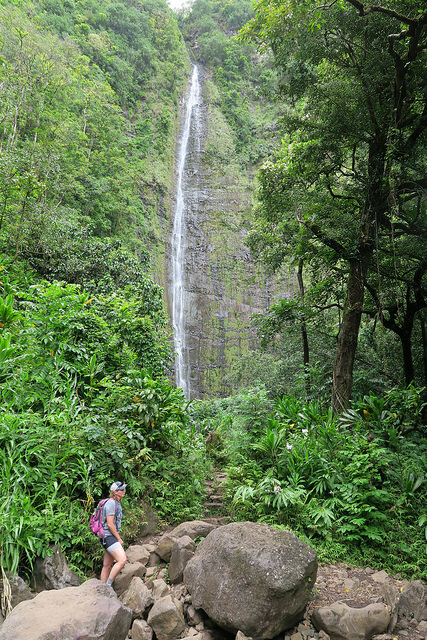 A dozen awesome waterfalls later, we landed on the southeast side of Maui at the base of Haleakala National Park to hike the 4-mile Pipiwai Trail through an incredible bamboo forest up to Waimoku Falls. 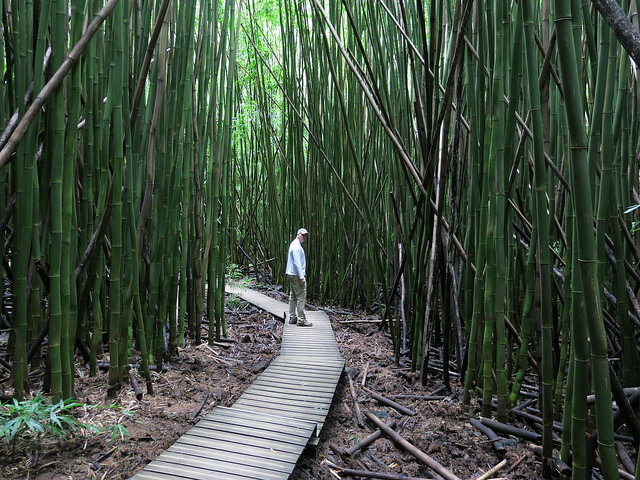 The bamboo forest sang to us in the wind, like a impromptu percussion concert. Waimoku Falls is just one of many waterfalls we admired on our first day. Day one complete. Our warm up for what Haleakala had to dish out the next 2 days. 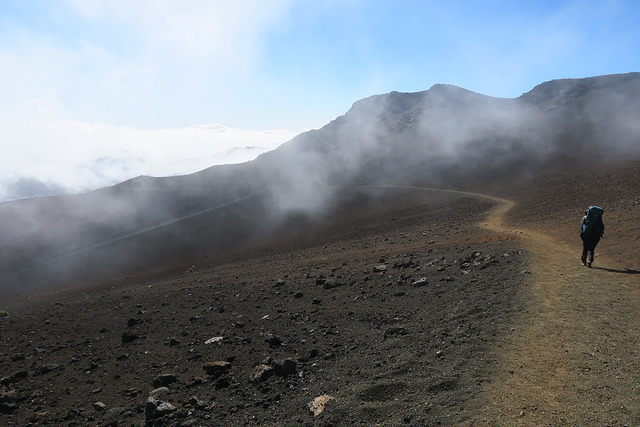 In the morning, we drove to the 10,000 ft. summit of Haleakala to find the crater below invisible–completely socked in with clouds. 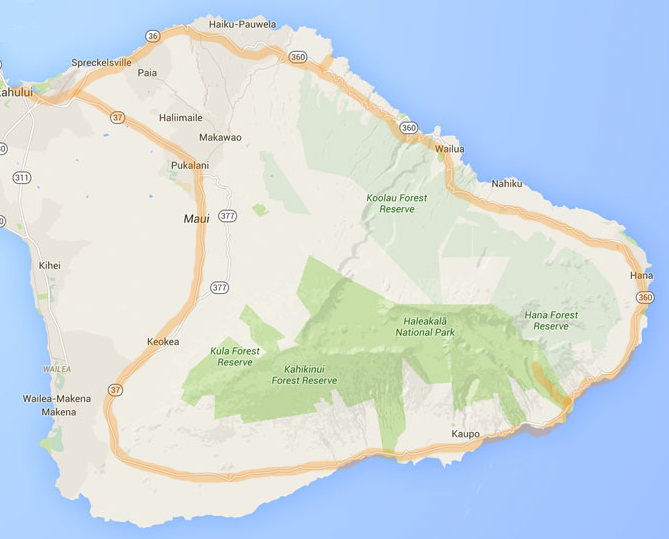 We dropped off our gear at the visitor’s center then staged a car at the Halemalu’u Trailhead. My husband hitched a ride back to the summit via the handy hiker’s hitching spot. Day two the yellow line. Day three the blue line. 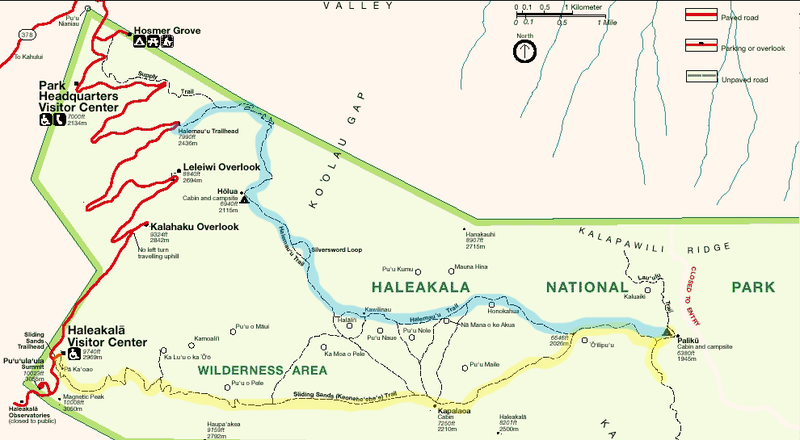 We took the Sliding Sands Trail all the way to Paliku (yellow line above), a wilderness backcountry campsite. Dropping into the crater on the Sliding Sands Trail. We stopped for lunch at the Kapalaoa trail junction for a snack after descending 2490 feet and traveling 5.6 miles. 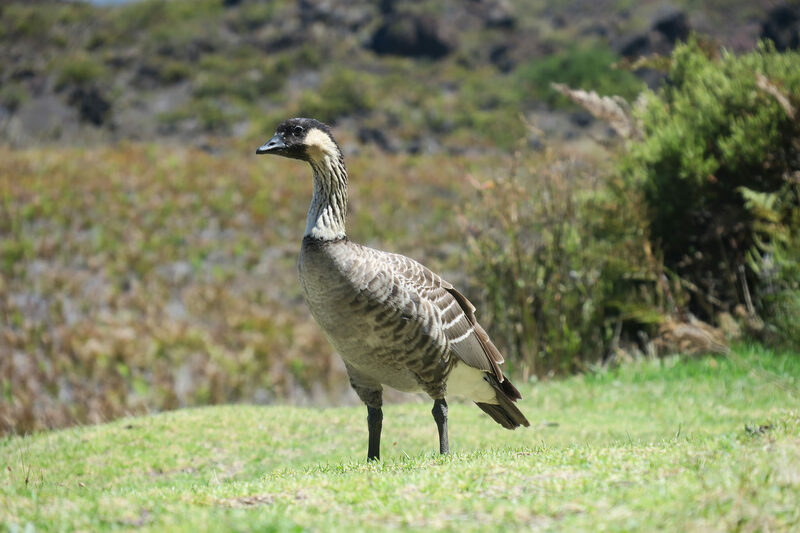 The Nene Goose, endemic to the Hawaiian Islands, stopped by to say hello at the halfway point. We continued for the next two miles through a hot and rough trail of lava rock. The last mile offered relief from the rock and descended down into the Kaupo gap. We reached the Paliku campsite after a total of a 3360 ft elevation drop and 9.1 mile hike from our starting position. The total walk took us 5.5 hours. We had a few hours to set up camp before the gap became completely socked in with clouds, wind, and rain. During that time, I took a stroll before sunset down part of the Kaupo trail to get a good view of the ocean and the 13,000 ft. Mauna Loa and Mauna Kea volcanos in the distance on The Big Island. This is the part where I am freezing in Hawaii. After epic winds and rain pelted our tent all night, a sudden calm woke me at 3:30 AM. We got out of the tent and were treated to a sky filled with so many stars there was hardly room for the inky blackness to spill between them. After 30 minutes of “wow” we slept until dawn and were met with rain again in the morning as we began our wet hike out via the Halemalu’u Trail. We were treated with a new landscape on the way back, less sharp lava and more “grassland-like” terrain for the first 5K. Then our landscape turned into a walk on “Mars” for the next 5K until we reached the wilderness camp of Holua. For three miles we felt like we were on another planet. After lunch we had the grueling job of climbing out of the crater on a 3.7 mile switchback up 1000 ft. to Halemalu’u overlook where we staged the car. A total of 10.3 miles for Day 3. 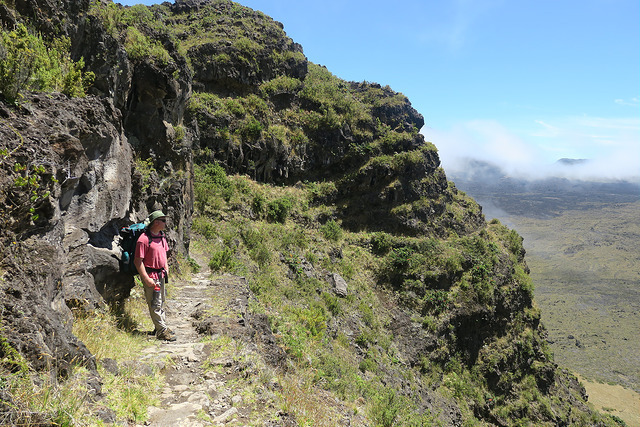 A whole new climate and terrain treated us with views of the gap on the opposite side of the crater on our steep hike out. Were we tired? Yes. Were we sore? Yes. Were we glad we did Hawaii differently? Yes. And, yes, I’d do it again. I hear the term “communing with nature” a lot. 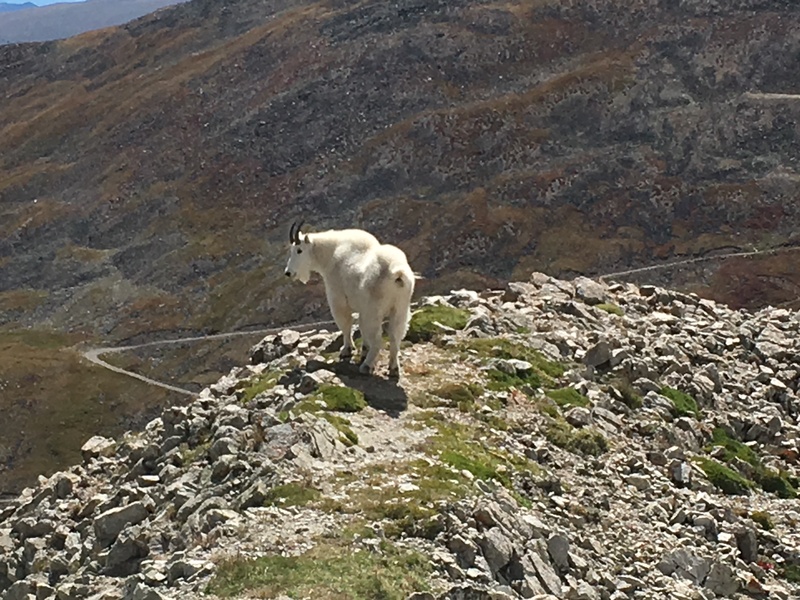 But I never really thought about what it meant until last week when I had a conversation with a mountain goat. My walks and bike rides in nature are more than exercise for me. They always have been. They’re spiritual. But I’m not sure I can say I commune with rocks, mountains, and trees. I would call that more deep awe and appreciation of the world, as I commune with God. Commune: share one’s intimate thoughts or feelings with (someone or something), especially when the exchange is on a spiritual level. 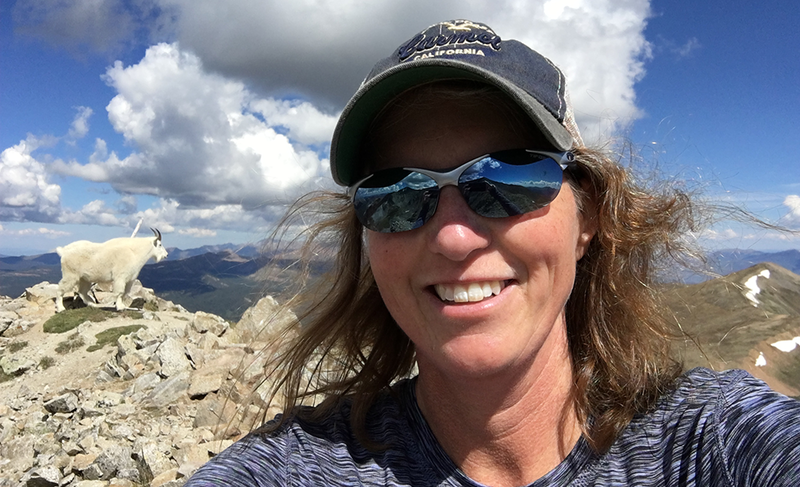 But last week on the top of Peak 9 in Breckenridge, Colorado, I communed, with nature itself. As I neared the summit, a mountain goat was also ascending. He took his place at the summit and stood his ground. Though at the top, I was not at the true summit. He stood where I needed to be to finish my goal. About 12 ft from me, we stared at each other along the ridge. He began moving toward me. I put my head down, acknowledging it was his mountain and stepped to the side of the ridge, offering him a path to walk by me. As if he knew my intention, he walked right by and stood at the other end of the ridge, waiting for me to take my turn at the top. 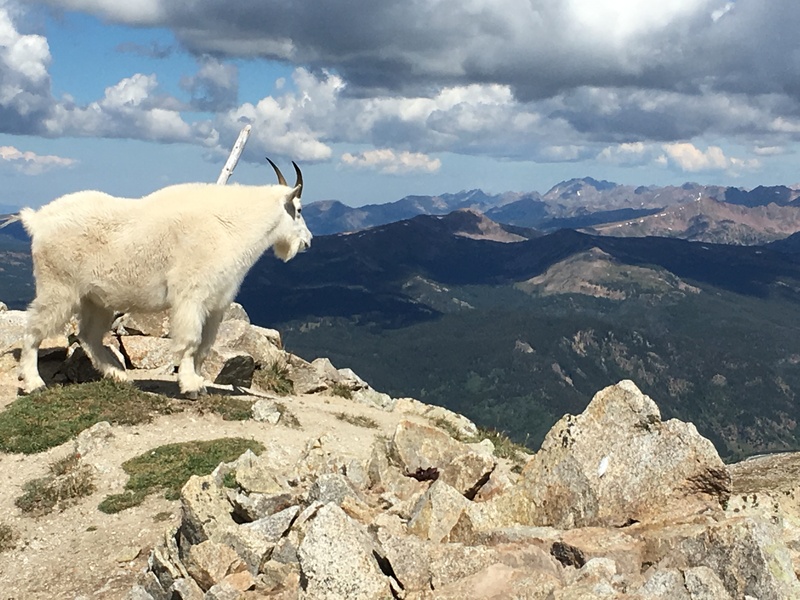 My new friend “Bucky” standing at the summit of Peak 9. After a couple pictures and a look around, he looked at me again and made it clear it was time to switch places and time for me to leave. It was one of the most amazing experiences of my life. 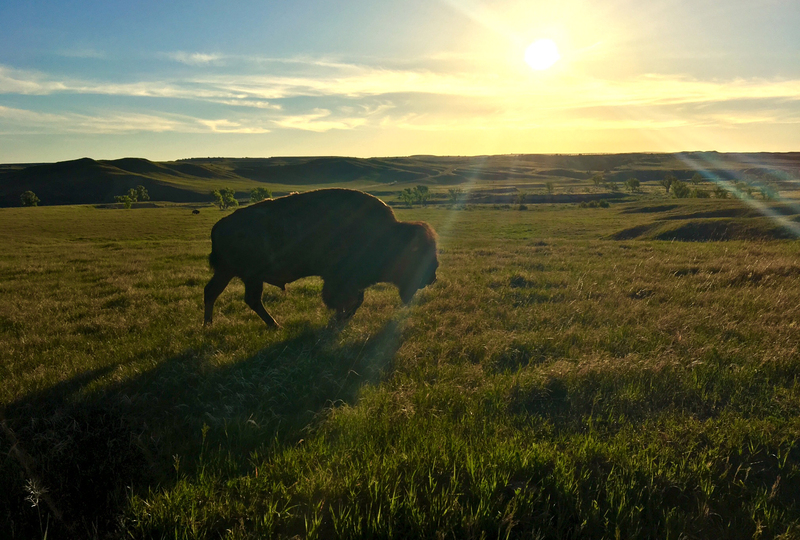 I’ve seen a lot of wildlife. Studied them. Watched them. But never talked to them. Never had a friendly conversation and a civil exchange of intentions. My new friend waits on the other side of the ridge while I take my summit photos and claim my prize. In those moments I remembered this wasn’t my first experience with goats and high places. I was reminded of my trip to Greece many years ago, where my journey led me to the highest heights in Crete. 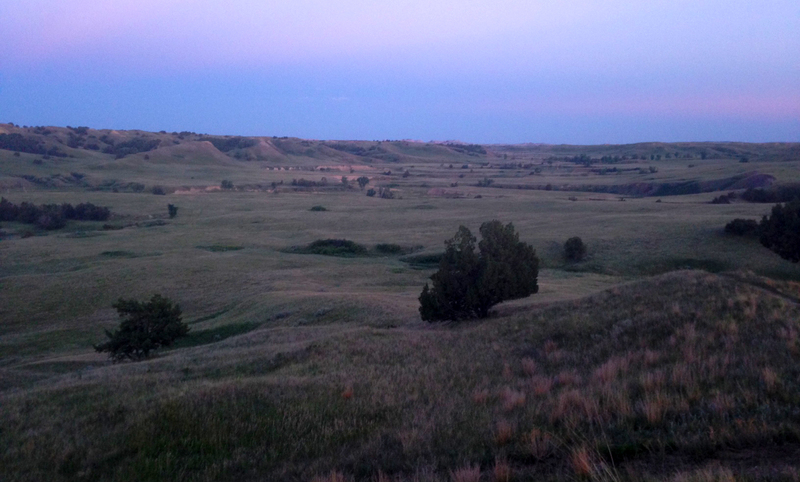 While backpacking, I was left dehydrated and tired one night only to awaken to the what sounded like fairies singing. The fairies were actually the bells jingling around the necks of goats, and unbeknownst to me, I was asleep in their pen. The water I drank from their well that morning saved me. My goat herd alarm clock in Crete (1992) , leading me to water (left). Standing at the summit (right) now hydrated and able to find a way down. There’s something incredible about being so close to the sky. So close to heaven–heaven on Earth. An Eden, where the lion lies down with the lamb. Or in this case, the human with the goat. After my time at summits, I sadly must always descend. It is over all too quickly. The reality of the fall hits me hard…back down the mountain I go. Still communing, but with a harsh reality facing gravity and its less than gentle push forward. But I’m so grateful for my time at the top. Thanks for the peek at heaven, my fluffy friends! 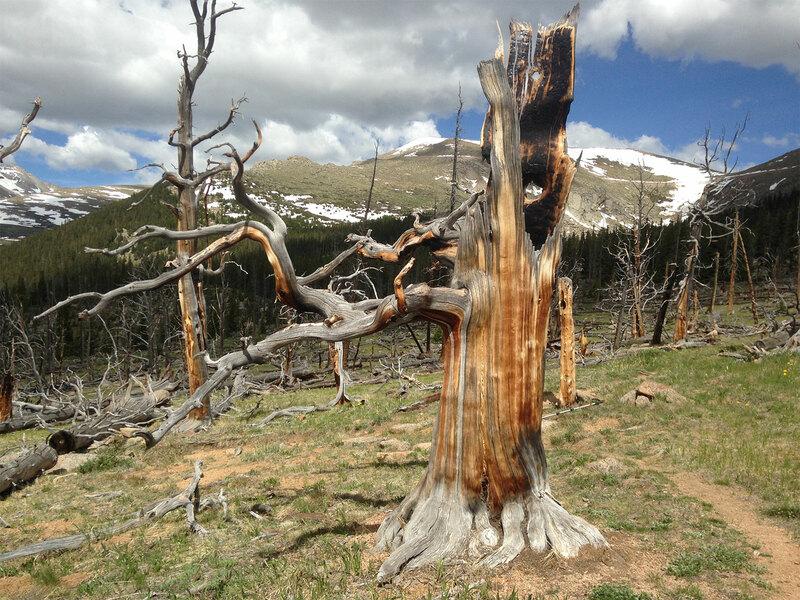 Beautiful even in death, this gnarly tree reached out its arms as a greeting, or possibly a warning, on my way to Lincoln Lake near Mt. Evans. 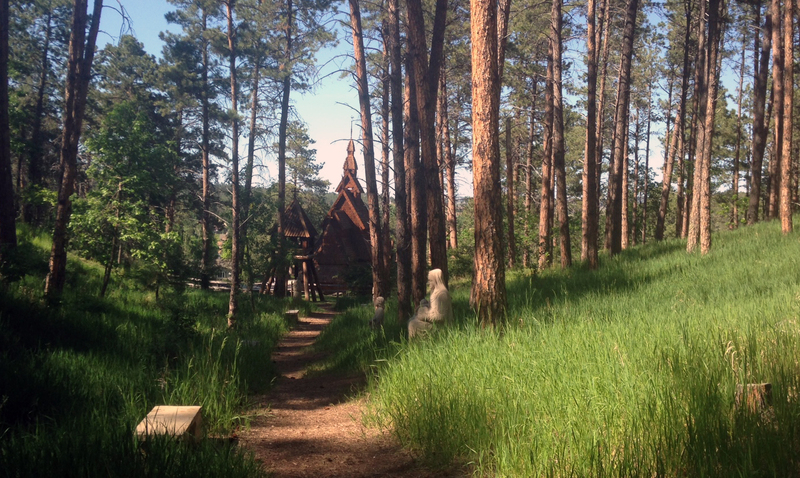 I’m always delighted and often surprised by the surroundings on hikes in my native Rocky Mountains. It is a rare day when a rushing rill or a sneaky squirrel doesn’t touch my heart and lighten my spirit. Today, it was death that amazed me. The death of trees burned in a fire. 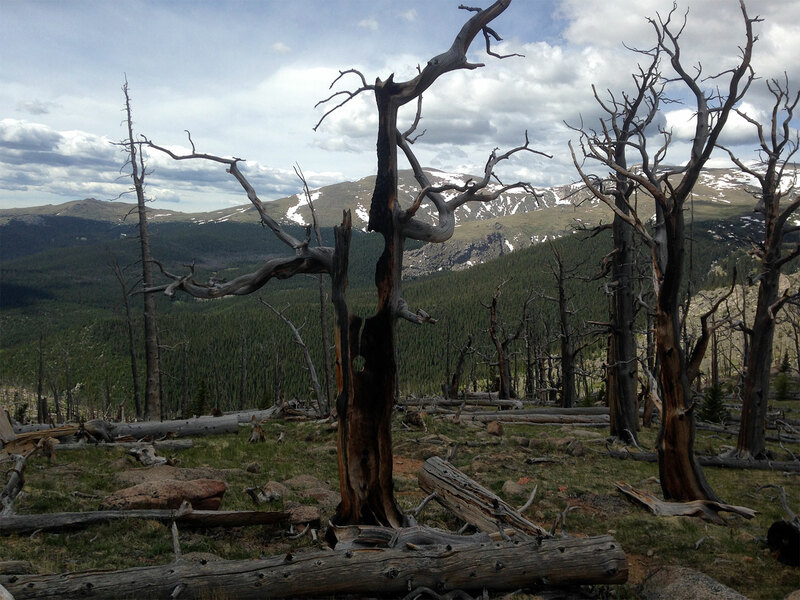 A burn area with remarkable trees—trees that refused to lay down their lives. Rather than pathetic scorched snags or trunks littering the ground, what remained were beautiful brown cores with scraggly branches forever reaching out —like the arms of lovers on John Keats’ Grecian urn. Living trees give mankind shelter, food, and medicine, and thus, have long provided us with symbolic and metaphorical fodder for life. Yet not in life, but in death, did these trees leave me a poetic freeze-frame. The stubborn branches whispered as I walked by: Beauty is truth, truth beauty, –that is all ye know on earth, and all ye need to know. Cast in the shadow of a cloud, you can see how trees like these could conjure up the likeness of monsters or mystical beings. It is easy to see where Tolkien came up with Ents–tree creatures in Lord of the Rings. Now that is a seriously large gumball machine! I like a destination. And when I’m traveling for work, I like to get my exercise not in the fitness room, if at all possible, but by walking around my new environment and getting a feeling for where I am. Staying in a cheap government per diem hotel in Las Vegas, doesn’t always put you in the optimal location for fantastic hikes, but it does often put you smack in the middle of an adventure. 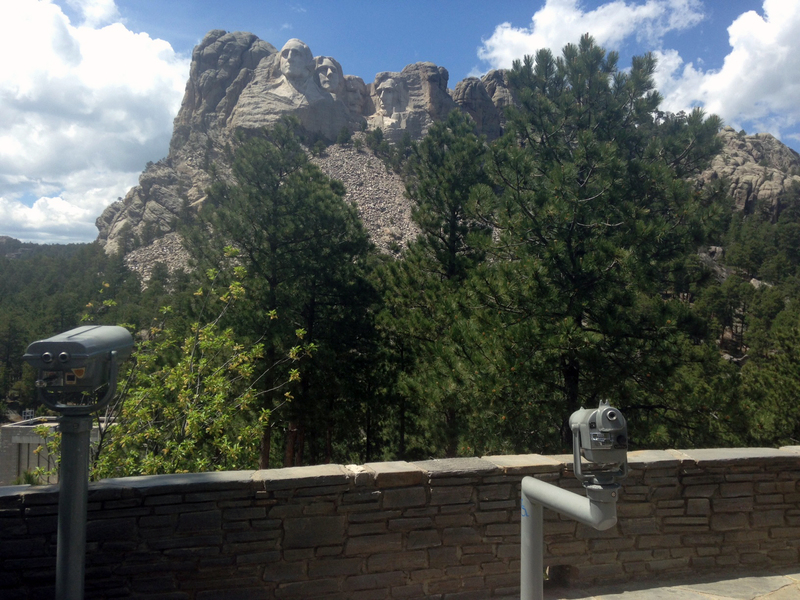 Knowing this was my only opportunity in the next four days to walk outside (during the day before mugging hours), my quest was to get to the closest attraction on Google maps from my location. That meant just shy of a 3.5 mile walk (one way) to the Pinball Hall of Fame. With dusk on the horizon, I knew I needed to make this walk snappy. I walked on sidewalks along busy six lane streets bordered by chain linked fences topped with barbed wire curls. Planes dipped so close to my head I fought the urge to duck. I thought it quite convenient there was a mortuary and graveyard across the street. My route to the Pinball Hall of Fame. When I finally got off the main thoroughfare and around the airport, I turned in the direction of my target. I can’t say I felt particularly better here, but at least the airplanes weren’t after me. 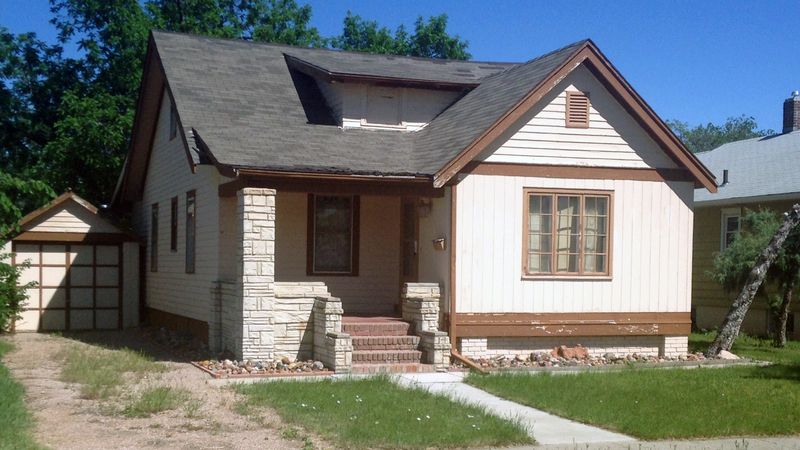 As I walked past Siegfried and Roy Park, which consisted of gravel and a giant silver mushroom-like statue, I passed row after row of apartments. Tucked beneath several of the gates were homeless people. And between them, rows of stores that included at least one or more of the following: liquor stores, tattoo parlors, and smoke shops. How lucky! Open 24 hours! I said “hi” to those I passed, looking less out of place than you would think. The temperature was a cool 45 degrees so I was sporting my black stocking cap, black running gloves, sunglasses, and a black leather jacket (the only coat I had brought). I looked like a hood in the hood. That probably was a good thing. After an hour of walking, I made it! The Pinball Hall of Fame. I was not too impressed by the sign. Where were the neon and flashing lights? Where were the free food and fountains? I clearly had not walked far enough. Not the most impressive building I’ve ever seen, but I’d made it this far! I went in and was shocked by the number of people inside (despite the missing cars in the lot). For $0.75 a game, you could play pinball on machines from the 1960s to modern day. I walked among the pinging and ringing, snapped a few photos and then quickly left. Elvira! Now that is a pretty high score! Now I had a dilemma. It was getting dark. And though I looked like I could rob a bank, I didn’t feel like it. Luckily, I had a twenty dollar bill and had scanned the bus routes earlier that day. I stopped at a nearby 7-11 to get change and purchase water. Two men wearing construction uniforms sat at the video slots and finished off their day with a bit of hope. I stood in line behind five people (all unrelated), each with multiple 24 oz. Bud Ice beers in their hands. Apparently they knew something I didn’t. My Aquafina was clearly not the best bargain in town. At this point I started jogging toward Eastern Avenue. As I reached the corner of Tropicana and Eastern, I saw the bus parked at a stop about 100 meters in front of me. I started sprinting. There was a man waiting to board and by the time I reached the bus the same man was still standing patiently waiting his turn. The fellow in front of him was feeding the bus fare machine slowly with pennies and nickels (possibly not realizing it was not a slot machine), but I was grateful. I caught my breath as the gentleman ahead of me and I assisted by picking up rogue pennies as they rolled off the machine and onto the bus floor. I hopped on the double decker bus and watched as a colorful cast of characters got on and off (fully aware I was one of them). I was even asked where my motorcycle was! That’s how “bad to the bone” I looked! As I stepped off the bus (forgetting my bottle of purchased water on public transit for the second time that day), I was happy I trusted Vegas enough to go for a walk, and happy Vegas trusted a hood like me. 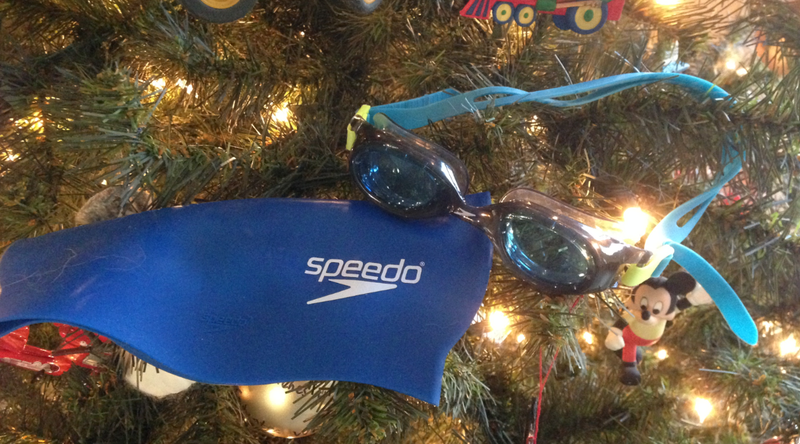 Deck the halls with swimming goggles! I swim at 6 a.m. on Monday and Wednesday every week and have been for the last year and a half. I’ve rarely missed a swim day. Even when injured I still show up and do what I can. Water has healing power. Some days I’ve been physically hurt and the hot jets have comforted my aching muscles. Some days I am frustrated and use the emotion to smash my 800m time. I love being in the water, but I’ve never loved swimming laps. I find it boring. I don’t meditate well. I fight with my thoughts as I blindly navigate the lane through my foggy goggles. To combat this, I’ve started using the time to solve work problems, compose poetry, write play scripts… I’ll solve almost anything to pass the time. Wednesday morning I couldn’t come up with a good swimming brain project, so I jokingly told my swimming buddy I was going to solve world peace. I didn’t realize that meant I was actually about to attempt to solve personal peace. After the first eight laps, the best I could come up with was “let’s all just be nice to each other.” Seems simple enough until you realize you can’t control other people. So that meant Peace on Earth starts with the peace I bring to it. I kept swimming. Hmmmm. If I don’t have peace, am I not pleasing to God? Made me think. Hmmm. So, I can bring some peace to the Earth and to others, but I can’t have it myself. Hmmmm. I didn’t like where this was going. I was pretty sure there was some twisted logic here and my graduate school rhetoric teacher would have scolded me by now for such a conclusion. Peace, MY peace, or lack thereof, is almost always attached to my judgment of myself—not meeting the impossible expectations I’ve set. And Christmas brings out the worst in me. It reminds me of my failure and of the injustices I have or am experiencing and sets me up for failing again or, at the very least, having little trust in any goodness to be found in the world. I can’t succeed at Christmas….not the way the songs want me to anyway. Splash. Turn. But maybe MY peace has nothing to do with God being pleased with me and a bunch of shepherds. He has already forgiven my imperfect self. That is the point of Christmas, after all, isn’t it? I conclude again that I’m the one with the problem. I’m the one who isn’t pleased. I’m the one who can’t forgive myself or cut myself a break. Splash. Turn. Lap fifteen. I’m pretty sure peace for the entire Earth is impossible to solve. But maybe, just maybe, Peace on Earth for me is possible, some days, even during, or maybe especially during, Christmas. So now I’ve got something else to try not to fail at—personal peace. I wonder what that looks like? I think it may look like trust…or faith…or simply letting go. Splash. Done. Guess I’ll need to wait until Monday to finish solving this one. You can take the girl out of the running, but you can’t take the running out of the girl. I am a runner—at least in my soul. My mind still thinks I’m a runner. My body doesn’t always agree. I spent this crisp fall morning not out bounding over crunchy leaves, but in a gym doing interval training. Seems ridiculous to me. My time felt ridiculous as well. I slowed the machine down to snap this picture when I hit 3.1 miles. The time is a bit deceiving. I sprinted a lot of this 5K on an incline. But the time also doesn’t lie. I jogged in between the sprints. I decided to do some math to ease my pain. If I ran an 18 minute 5K when I was 20, then when I double my age I should be able to double my time, right? So that means anything under 43 minutes would be incredible. After knee surgery in college and back surgery in my late twenties, running has been the itch I just can’t scratch. I tiptoe back into it whenever I can and often end up discouraged or injured. But not this month. I’ve actually been running (carefully) three times a week. I don’t want to jinx it. And I can feel the cross country returning to my soul and filling me with joy again. I think I’m almost ready to take it outside—where I want to be. But there are potential hazards out there. Birds for one. Rocks for another. 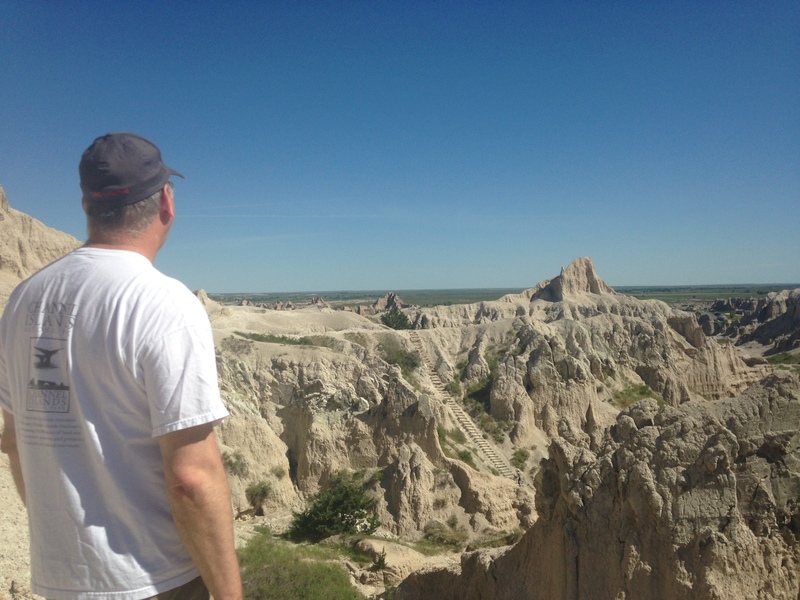 And my own self…who tends to think I’m still 20 when I hit the trail. I’m pretty sure I’ll never stop trying to run. My old shoes in my keepsake box remind me of that. Why did I keep them? Did I think they were magic? That if I put them on some year in the future I would be able to run—really run—again. No. I think they just serve as a constant reminder that you can’t stop being who you are. 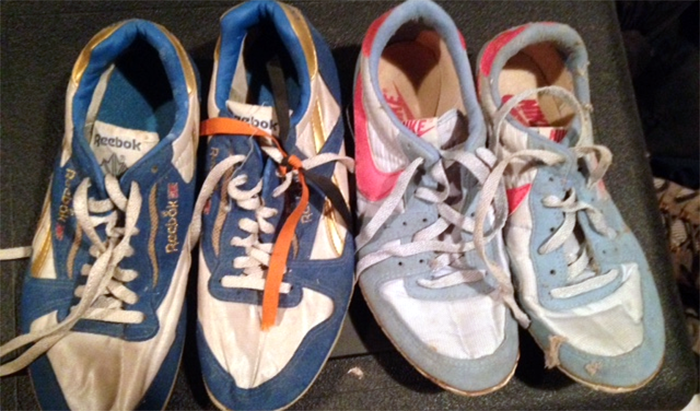 My cross country spikes and flats from high school and college remind me that I’ll always be a runner. I saw my shadow differently today. Not as who I was but who I am now and who I still can be. I’m back in the shadow again. After a July and August filled with sickness and total exhaustion, I have made it back onto my mountain bike for only my second real mountain bike ride of the summer. The first involved a rainstorm, a steep mountain road, and no brakes….but I’d rather not remember that one. Let’s talk about today. Today I panted my way up our friendly neighborhood mesa. Once at the top it is a paradise of flat winding trails. As I zoomed across the mesa top, I kept my head down, navigating the rocks and watching for rattlesnakes for a good 10 minutes until I caught my shadow cast by the late afternoon sun. It is like watching a movie of myself. I love shadows because you can see who you want to be in your shadow. For years I’ve always looked at the shadow and saw who I used to be as an athlete and lamented that I would never be that again. Not today. Today I was grateful for my shadow. Today, I just saw me out on my bike riding free and being who I am today with the promise of who I can be tomorrow. Once I did that, an amazing thing happened. I looked up and I saw not where I couldn’t be, but where I was. Wow. What a view! 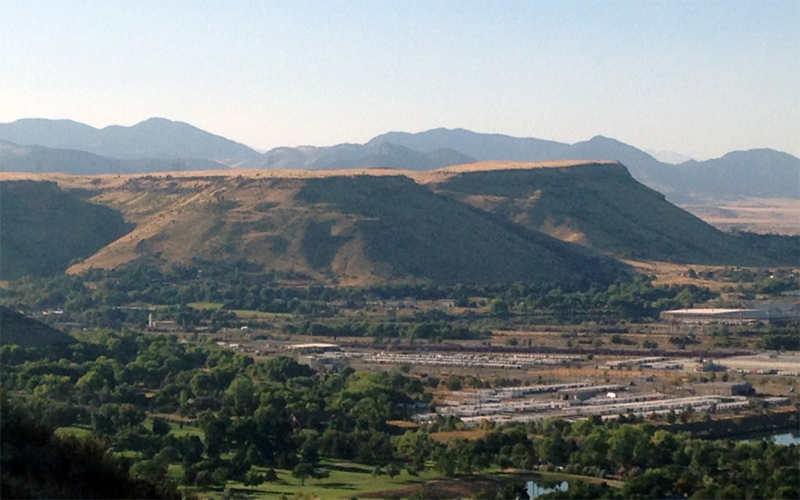 The view from the mesa with beautiful Rocky Mountains as a backdrop. As I kept riding (only looking down when I had to maneuver up and over rocks), I came across the acres of charred earth where a fire had scorched the top of the mesa several weeks ago. Again I was struck by the beauty of what can come from the ashes—what can rise that once was fallen. They were Black-eyed Susans—their petals on fire from the setting sun. I laughed as I took this picture. I felt like this flower. 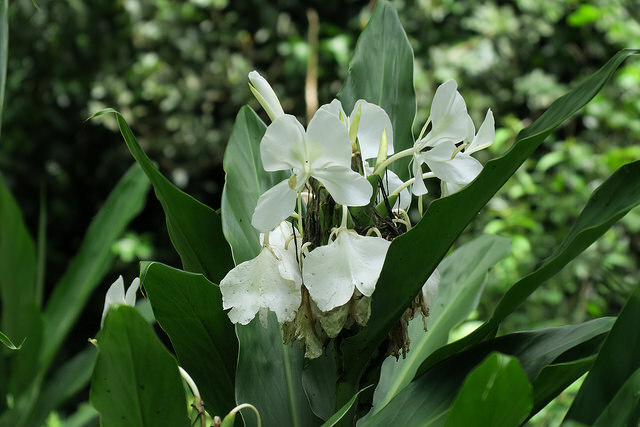 What a perfect flower name for this rebirth —you can knock me down and give me a black eye, but I’ll keep coming back! Charles Dickens once said, “There are dark shadows on the earth, but its lights are stronger in the contrast.” That was so true today—for the flowers and for me. These hardy yellow flowers are bursting forth amidst acres of charred soil. One minion riding a fluffy unicorn, two minions riding a fluffy unicorn, three minions riding a fluffy unicorn…….. If you haven’t noticed, my blogs have been few and far between the past few months. But not because my head isn’t reeling with topics. I now realize my bloglessness has been due to total exhaustion. Complete and utter total exhaustion. Total exhaustion has never been a negative phrase for me. Total exhaustion, rather, has been a battle cry. It is something I aspire to when climbing peaks or riding my bike. In fact, it’s become a game. How much harder can I make it? For example, is there an alternative way to get to the trailhead? Anyone can drive there. 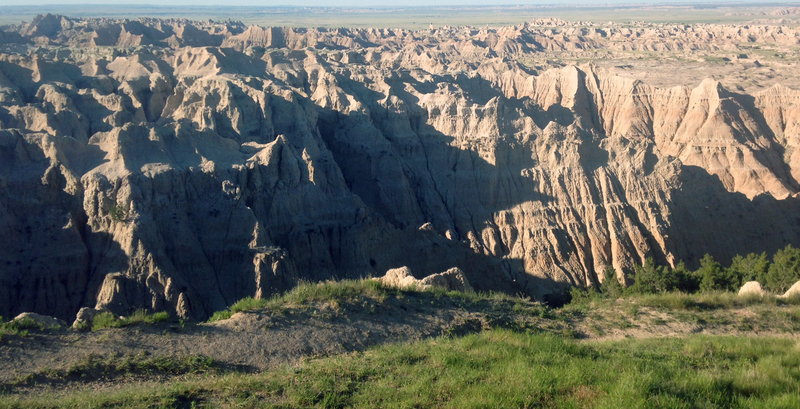 How about riding my bike there…and then back after finishing a grueling climb? Yes! Total exhaustion! Bring it on. This summer I discovered a new form of total exhaustion. And I did something I can’t remember ever doing before. I took a nap—a real nap. Not just nodding off for 15 minutes on the lawn furniture on a sunny Saturday. No. I got up at 8:00 a.m. on a work day (really late for me), stood up, checked my phone, wrote my boss a “not happening today” note, and didn’t get out of bed again until 12:30…possibly 1:00. What drove me to total exhaustion? It wasn’t a mountain I had climbed or a pass I had peddled. No.It was mental and physical exhaustion from work and simply finally letting myself fully recover from the cold I had fought with for the last four weeks. Although there were no lingering signs of the infection in my sinuses, it had apparently sucked the life from me and my body was still crying…I just refused to listen…until what I will now and forevermore refer to as THE NAP. But, no more! My mind is doing cartwheels and my body thanking me all because of THE NAP. And because it was so amazing, I followed it up with a shorter sequel today …THE NAP 2. In fact, I have not thought of work once today. Not obsessing over our startup business struggles. Not counting my long list of “to dos.” Nope. Just counting minions riding fluffy unicorns as they bounce over my head…1…2…3… Zzzzzz! 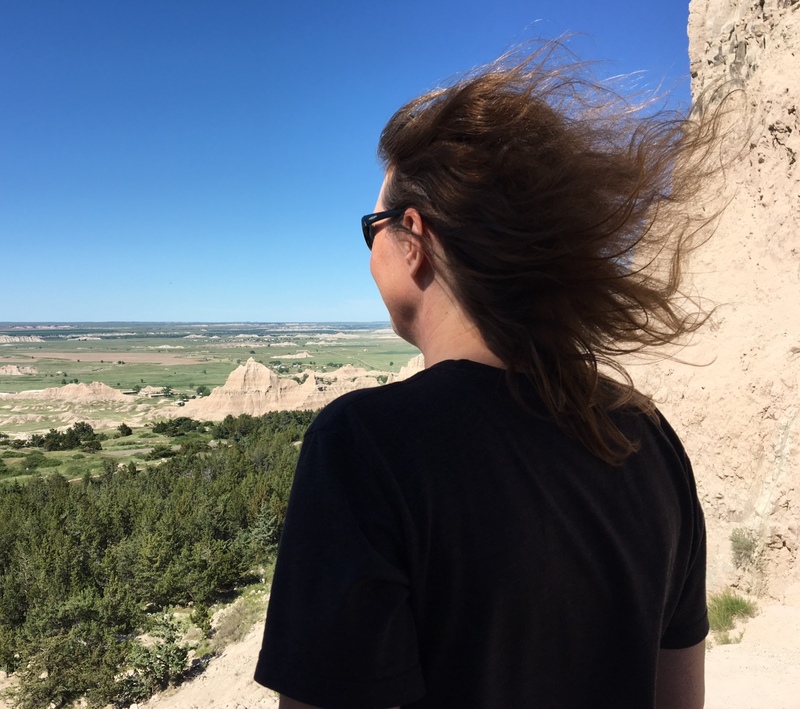 Now I believe I am ready to blog again, ride again, hike again…maybe, just maybe, even work again. Naps. Who knew? Maybe I’m getting older and this is what crossing the midline is all about. Or maybe I’m just getting wiser and maybe that is what crossing the midline is all about. Either way I’ve found a new friend called sleep.